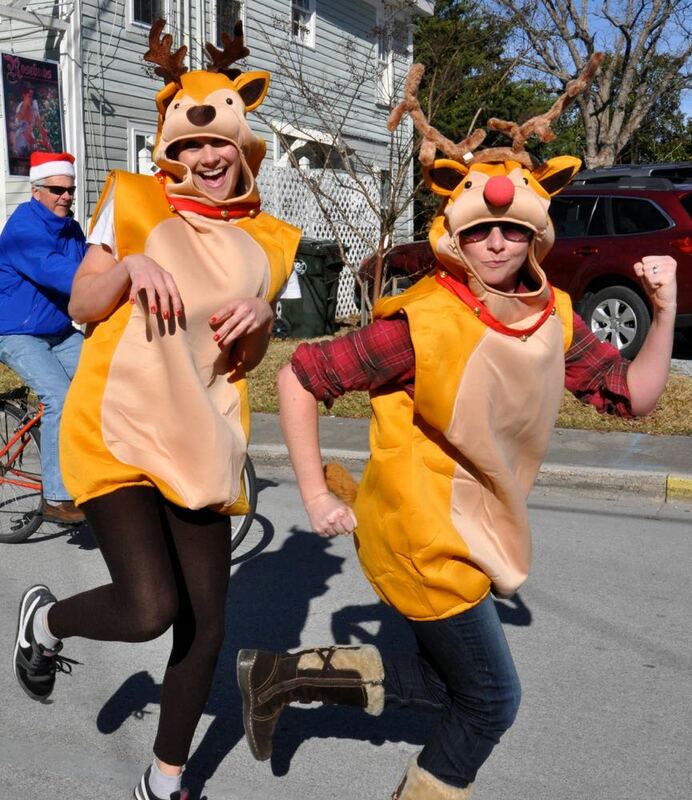 eindeer were out in numbers at Oriental’s 2014 Spirit of Christmas Parade. Also in the mix, – a couple of pigs, a dragon and guys in bathrobes (and one kilt.) Not quite what most Christmas parades would highlight but the emphasis on Broad and Hodges Streets on Saturday seemed to be on spirit. Reindeer from 1st Citizens Bank in an homage to the TV-movie Rudolph the Red Nosed Reindeer. This year’s parade theme was Holidays in the Movies. A few entries rose to that challenge. First Citizens Bank paid tribute to the Rudolph TV-movie, with two tellers prancing along the parade route. 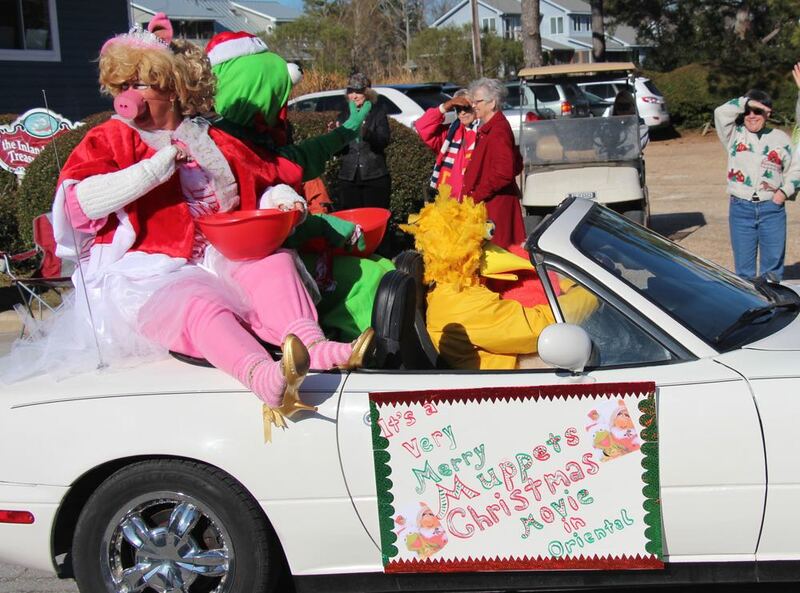 The movie-theme call out is how one of the pigs — Maggie Monk dressed as Miss Piggy from the Muppets Christmas Movie on the Pigeon Holes float — came to be in the Christmas parade. Reindeer clearly outnumbered pigs, though. There were dogs who sported substantial one-day growth of antlers. 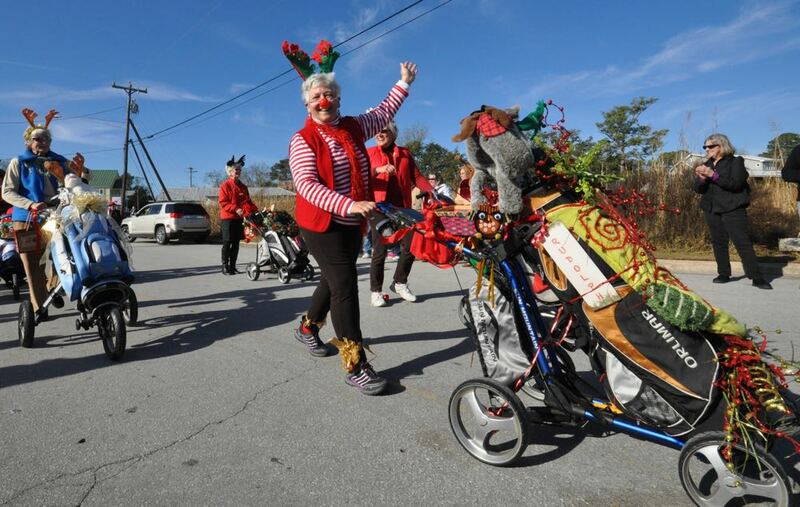 And golf bags appeared as reindeer, too, pushed along by the golfers in the Minnesott Ladies Golf Association. Some reindeer rolled in with golf bags, accompanied by the Ladies Golf Association at Minnesott Golf and Country Club. Old and classic vehicles were part of the scene, too. 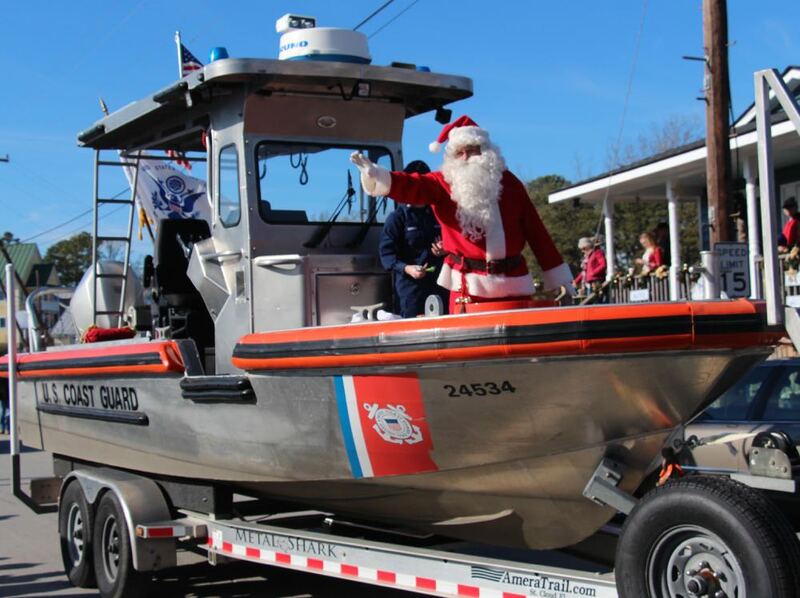 And Santa made his appearance on board a Coast Guard vessel trailered in from Hobucken. The parade moved to a new time this year, starting at 1p, several hours earlier than in past years. That made for a warmer and brighter experience. 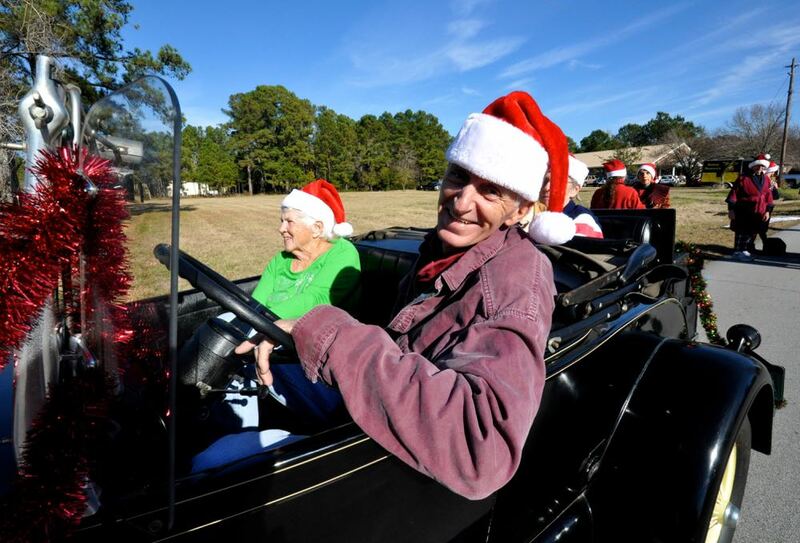 Skip Bailey took some friends on a ride in his newly acquired old car which was part of the parade. The Eleven Piping Pipers returned, with bows. Here, on Hodges Street near The Bean. 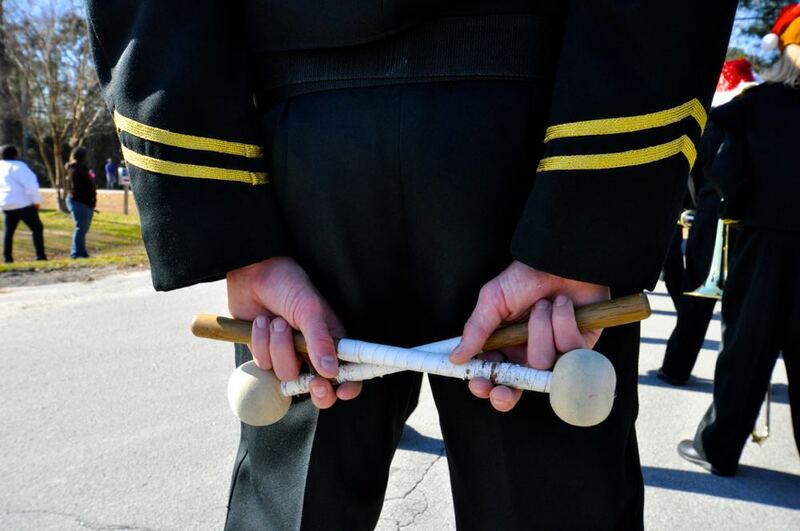 Before the pa-rum-pum-pum-pum, a drummer with the Pamlico High School band waits for the parade to begin.